To solve the Rubik's Cube , cubers use methods. There are many different ones, but each method consists of steps. In those steps, cubers solve part of the cube, so that in the end the cube is solved. In order to solve part of the cube in each step, cubers turn the sides certain ways, changing something. This is called an algorithm. Cubers learn algorithms, "alg(s)" for short, to complete different steps. Methods and algorithms don't just come out of thin air. Cubers have to discover them. When cubers discover new algorithms, they have to test a lot. They have to try different moves to see what they do. Sometimes it takes a long time to discover algorithms, other times it doesn't. Unlike most people, cubers learn properties of the cube that are very important to solving it. Each cube has 6 faces, or sides. On each face are 9 stickers with different colors on them. There are also different pieces. Edge pieces are pieces in the middle of each edge on the cube. They each have 2 stickers. There are corner pieces too. Corner pieces are pieces on the corners of the cube. Corner pieces have 3 stickers each. The last type of piece is the center piece. As you may have guessed, it’s the piece in the center of each face. Center pieces only have 1 sticker. Another property is that each sticker stays on it’s piece. The pieces themselves are the only things that move when the cube is turned. Also, take note that whenever a face is turned, the center piece always stays in it’s place. All the other pieces move around it. When the cube is solved, all the stickers will match the color of the center piece on their face. 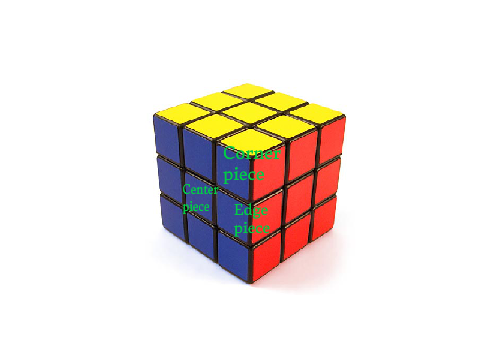 Lastly, there are 6 different colors on the Rubik’s Cube. They are white, yellow, green, blue, red, and orange. The center piece with white on it will always be on the opposite side of the yellow center piece. Green will be opposite blue and red will be opposite orange. The first version of the Rubik’s Cube, invented by Erno Rubik’s in 1974 had no stickers. It also had flat corners. He probably added stickers later on to make it solvable.